I'm almost certain that you have heard of King Cashalot before, it is after all one of the most famous slot games in the online casino world. Created by Microgaming, King Cashalot has a minimum progressive jackpot of £100,000. Such is the popularity of King Cashalot that it is featured on plenty of online casinos the internet over. It's appeal is legendary and with a rich history of successful winners, some going to become millionaires, you'll almost certainly be in with a chance of netting yourself a tidy little earner whilst gathered queens, knights and feasts across it's five reels and nine pay lines. Despite doubtlessly named after King Arthur's medieval court, King Cashalot has quite a mixed up, shuffled appearance. Very brightly coloured, with fruits, knights, damsels in distress and fat turkeys all used a symbols, there is a great number of opportunities to win. The pay out list details which of these symbols are the most important to get you to that big jackpot, with the king obviously being the number one target. Hilariously, though rather predictably, the scatter symbol lies with the Jester. Lining up several of courts top clown, will reward you with a fairly large multiple of what you had originally wagered on the spin. That's equates to your wager back, and then some! Collecting the King Cashalot symbol counts a wild card, in which it can be substitute for any additional symbol you may require to complete a successful pay line. Bonus games are also featured on King Cashalot. Collect three golden dragons and you'll be given the opportunity to open a treasure chest, containing a sum anywhere between a fiver and a fifty. But it's not all random, the choice is up to you. You may choose to negotiate the offer, and decide to open an additional two more chests instead, so think carefully. You may not be happy with the amount offered in the first treasure chest, but it may be a lot better than what lies in the following two chests! If you want to be in with a shot of netting that bumper progressive jackpot then you'll want to activate all of King Cashalot's pay lines, and doing so will set you back a measly £2.25. 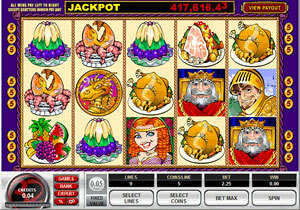 This makes King Cashalot certainly one of the cheapest of all casino slots to enable you the use of all nine pay lines. But as with most giant progressive jackpots, the biggest win is only valid if you have it on the ninth pay line. So don't be too shrewd with your stakes! With King Cashalot's progressive jackpots, you could very well find yourself lifted our of the middle ages, and into a golden age of rich winnings. So what do you say knave? Do you fancy your chances at court?